The released of Revenue Regulations No 10-2014 by the BIR had expanded the coverage of taxpayers required to file returns and pay taxes through the use of the electronic Filing and Payment System (eFPS). The said regulation was promulgated to amend pertinent provisions of RR No. 9-2001, as last amended by RR No. 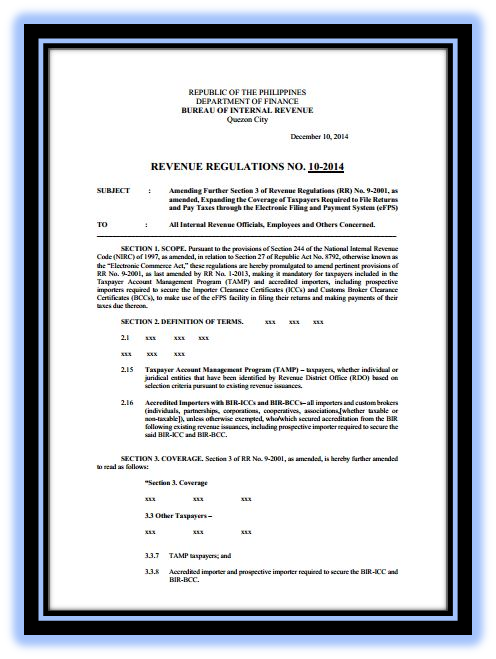 1-2013, making it mandatory to additional sets of taxpayer groups. Accredited importers, including prospective importers required to secure the Importer Clearance Certificates (ICCs) and Customs Broker Clearance Certificates (BCCs). These new batch of taxpayers are required to make use of the eFPS facility in filing their returns and making payments of their taxes due thereon.